Electronic Arts will show strongly at next week's San Diego Comic-Con, armed with ten games and plenty of panels. It may be your first chance to go hands on with games like Left 4 Dead 2 and Dragon Age: Origins. Titles planned to be previewed on the show floor, at EA's booth, include Brütal Legend, Dante's Inferno, Dead Space Extraction, G.I. JOE The Rise of the Cobra, The Saboteur and Warhammer Online: Age of Reckoning. EA will also host the "EA Gaming Lounge presented by Xbox 360" at the Hilton San Diego Gaslamp Quarter Hotel during Comic-Con. 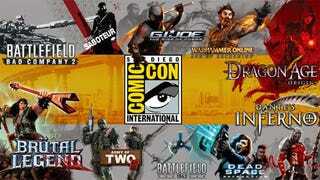 That off-con event will feature Dragon Age: Origins, Battlefield 1943, Battlefield: Bad Company 2 and Left 4 Dead 2. Loungers will be able to test drive the second campaign in L4D2, known as "Swamp Fever." For panel info, read on for official descriptions. See you at the con!